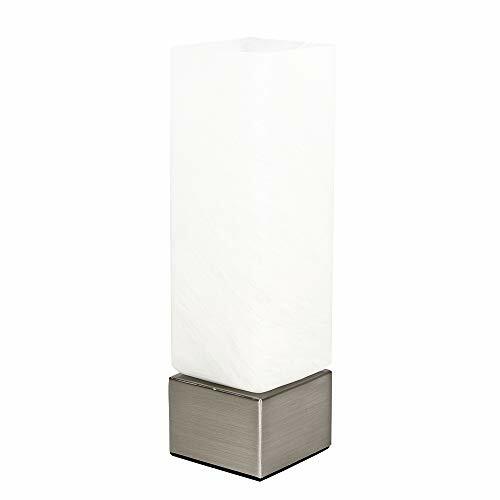 This fantastic square glass and metal based touch table lamp in brilliant brushed chrome is a wonderful addition to any contemporary home. The frosted glass shade allows the light to be dispersed throughout the room without the light becoming too harsh. The light can be set to 4 stages, off, a low level light for mood lighting, a medium level light for general lighting and a high level light which is the brightest setting to create an intense pool of light. Table lamps are brilliant as complementary lighting and are perfect to light up dull corners. Please Note: This lamp requires dimmable bulbs. Not suitable for standard LED or energy saving bulbs.